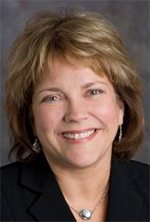 St. John Providence Health System has appointed Gay Landstrom as its new chief nursing officer. She will fill the position Jan. 1. Detroit, Southfield, Novi, Warren and Madison Heights. Landstrom has more than 30 years of nursing leadership experience. For the past three years, she served as executive vice president and CNO for Dartmouth-Hitchcock Health System in New Hampshire, including a recent interim appointment as CEO for one of its five hospitals. Landstrom also worked for Trinity Health for 20 years, where she eventually became CNO of the company’s health division. Since 2006, Landstrom has been a magnet appraiser for the American Nurses Credentialing Center, assisting with selecting healthcare organizations that exemplify excellence in nursing. Landstrom earned her bachelor’s degree from Rush University in Chicago, a master’s in nursing administration from the University of Illinois at Chicago, and a doctoral degree in nursing from the University of Michigan.